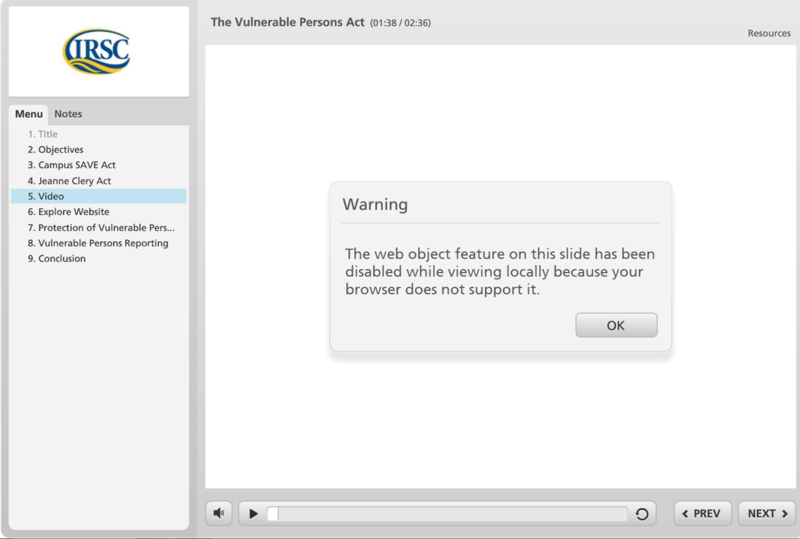 First, I was trying to embed a YouTube video in a presentation (Articulate Studio Presenter). I realize that after Google/YouTube made those changes in May 2015, I applied the solution available at http://www.articulate.com/support/presenter-13/how-to-add-a-youtube-video-to-articulate-presenter-13 . However, that works only for IE and Firefox, Chrome does not support it. I thought it was an error that would happen with YouTube videos only, but now I realize it seems to be the "norm" for any web object. In the screenshot below, 6. Explore Website is a website, not a YouTube video and it does not work in Google Chrome. Upload your content to some server and test again. You can see more information about the reasons behind Michael's suggestions here including some options for testing servers. "Upload your content to some server and test again."